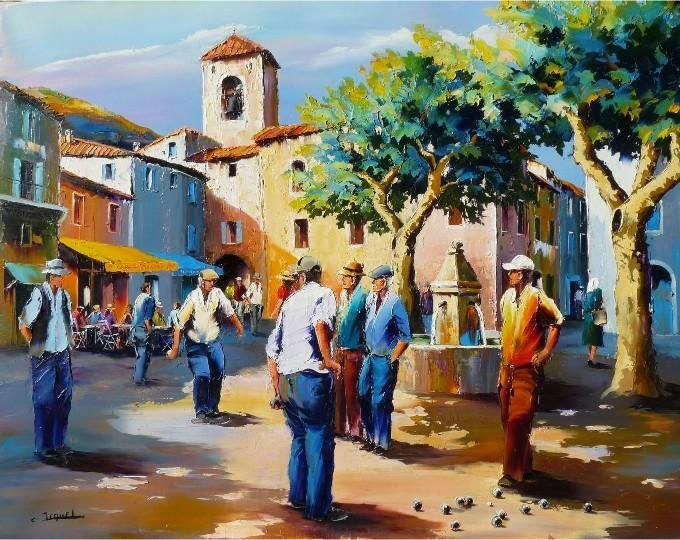 Provence … Petanque and Pastis … does any other combination of words, fit together more naturally? During the Spring, Summer and Fall look at any graveled parking lot, sandy spot in a park, beach or open space and the chances are that you will see one or more groups of men in peaked (or baseball) hats, gathered around, looking down at the ground, often with measuring tapes or arms outstretched making very strong gesticulations. As the measurements are discussed and disputed the gesticulations become greater and the voices a bit louder, until at last capitulation by the looser and everyone turns to their glass of Pastis for a refreshing sip. What is this all about? 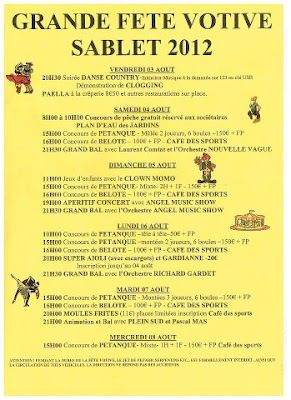 Petanque of course … and Pastis! 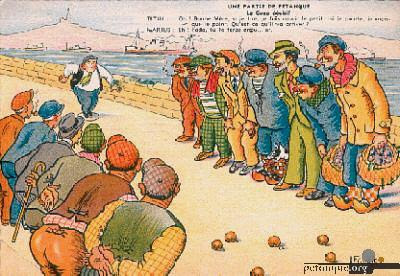 This old postcard set in Marseille displays just how intense with anticipation the atmosphere around a game of Petanque can become. Uniquely Provencal, both Petanque and Pastis originated in Marseilles area. 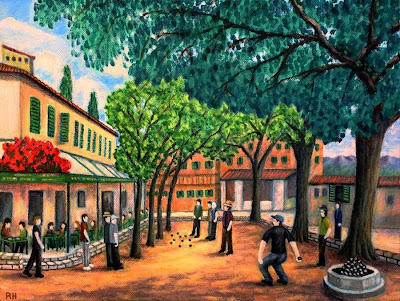 Petanque is definitely a local adaptation of what was the game known as Boules (even though you often hear the two names used for what is really Petanque). Although forms of the game can be traced back to Greek and Roman times in Provence, and those early forms of the game became so popular, that ordinary people were banned from playing it by the Kings of France, until the 16th Century (perhaps they had concerns about their subjects perfecting their rock throwing skills!). A more modern form of Petanque developed and in the 19th Century game of Boules had the same rules, but required the players to run (or jump) three large steps before tossing the heavy ball onto a court about 15 – 20 meters long. That was until a group of creative players from one of my favorite seaside towns of La Ciotat decided to change the rules to accommodate one of their friends who was a popular player, Jules Lenoir was unable to play due to chronic rheumatism. Instead of the running steps, the changed the rules to require that players stand with their feet together in a circle drawn in at the end of the court – hence the name “Petanque” which is derived from an expression in the old Provencal language that I have seen as both Pes tancats – meaning feet together and Ped tanca meaning anchored feet. Image courtesy of Brooklyn Boule Blogspot – Le Vrai Pastis and Boules a Provencal match made in heaven! Pastis – was first made in Marseille by Paul Ricard, who created it’s unique taste for his drink (le Vrai Pastis de Marseille) using star anise and a number of other herbs and aromatics found in Provence. At the time, Absinthe had been declared illegal and many people were trying to find a replacement for the popular drink. Pastis soon became a favorite in Southern France where it was drunk as a “long drink” – if you order Pastis, it will come with ice and a pitcher of water – and is usually mixed on a five parts of water to one part of Pastis. 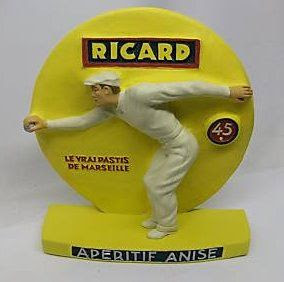 In 1962, Paul Ricard started a four day Petanque Tournament to be played in Marseille – which carries on today and is known as “Le Mondial”, thus cementing the relationship between “Le Vrai Pastis” and the most popular sporting pastime in Provence. Thank goodness for measuring tapes and sticks – I’m sure they save many friendships! 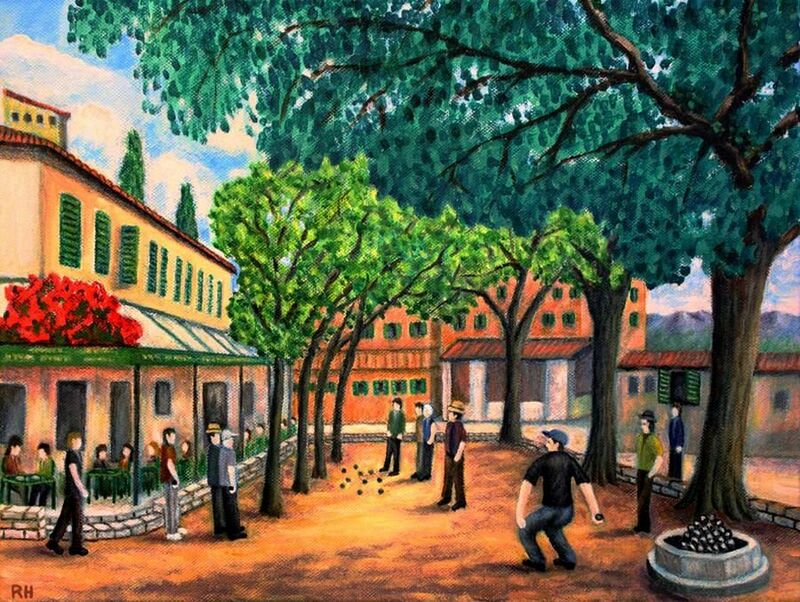 Image courtesy of www.Painters-online.uk.co – Players and onlookers enjoy the game and no doubt a cool Pastis! 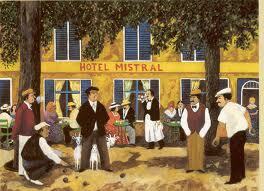 This scene can be seen in any town or village in Provence and has spread to many other parts of France. 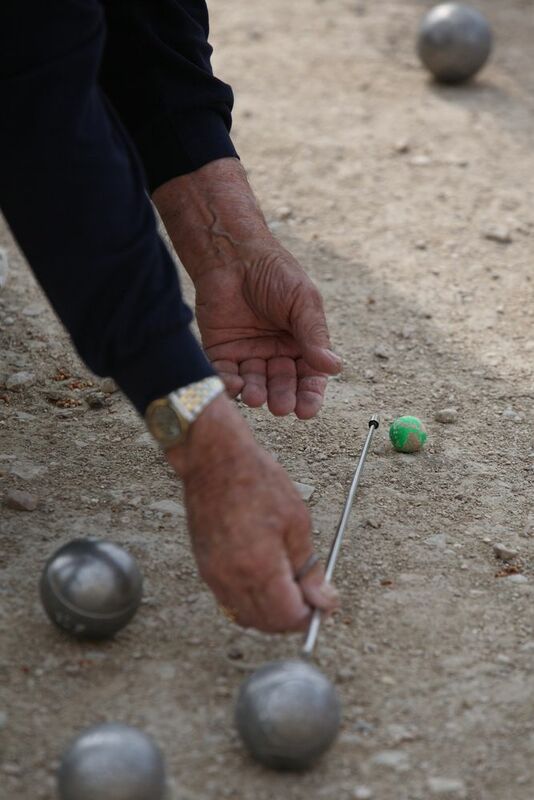 Although Marseille holds le Mondial in early July each year, any towns and villages hold Petanque tournaments. 2012’s “Affiche” from Sablet’s Fete Votive – apart from being a really fun time – a fie day boules competition! Our village of Sablet holds a five day tournament – on each day of the Fete Votive early in August. Not so coincidentally, both Petanque and Pastis originated in Marseille or nearby.